Focus on Kenneth D. Morse, P.A. Orlando Business and Divorce Lawyer Kenneth D. Morse provides exceptional legal representation to businesses and individuals throughout Central Florida for 34 years and has a reputation as being one of the best Orlando Family, Divorce , and Business Lawyer in Orlando Florida. Kenneth D. Morse strives to maintain the highest ethical and legal standards. He is AV®-rated* under Martindale-Hubbell’s peer review rating system and is listed as a preeminent Florida lawyer in the Bar Register of Preeminent Lawyers. 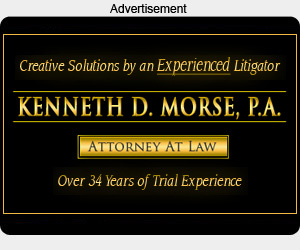 The Law Firm of Kenneth D. Morse, P.A. with offices in Orlando and Heathrow, has provided legal services for 34 years to both individuals and businesses throughout Central Florida with concentration on divorce law and its collateral issues, such as alimony, child support, custody, and enforcement. In addition to his divorce practice, Mr. Morse has extensive trial and transactional experience in business law, including commercial and residential real estate, construction and development, and contracts, and continues to represent many clients in civil and commercial business matters. Because of the nature of family law, which is often stressful and highly-charged, he sees people at their worst. : Much of the satisfaction of my job is getting them through the toughest financial and emotional times of their lives, not to mention achieving a good result,” he says. Although his downtown Orlando office has been in existence since his practice began, the newer Heathrow location was the logical next step for both professional and personal reasons. “The Lake Mary/Heathrow area is growing dramatically, he says, “and there will be an increased need for experienced and accessible business and family attorneys. “Even now, approximately half of his cases are filed in Seminole County. © 2009 Orlando Divorce and Family Law Blog.